Will China take the lead? So, it’s not surprising that when foreign-policy elites think about what will replace a US superpower in relative decline—speculation that has grown more feverish in the Trump era—they, too, look East. But no longer to Japan, which is passé, or South Korea, which has also perhaps peaked. Instead, they tremble before China, which has already surpassed the United States in gross economic output, while steadily enhancing its military capabilities. It seems like the only country remotely capable of challenging the United States as the world’s sole superpower. The anxiety of declining US influence became so intense during the Obama years that the notion of a Group of Two (G2) gained considerable currency: If we can’t beat ’em, went the thinking at the time, then maybe we should join ’em. However seriously intended such a proposal to co-rule the world with China might have been, the Obama administration never followed up beyond agreements on climate change and bilateral investment. Ambitious and impatient, Beijing decided to strike out on its own. It has unveiled a 21st-century, industrial-strength version of the post-World War II Marshall Plan with which the United States once put a devastated Europe back on its feet. China’s vision, however, focuses on the building up of all the countries on its periphery and some even further afield, as it tries to draw the whole Eurasian continent into its sphere of influence. Although it’s expected to provide an estimated $1 trillion to more than 60 countries, this “One Belt, One Road” plan is anything but a charity mission. It will direct a major influx of resources to Chinese construction companies, bring minerals and energy to Chinese factories, and promise a better potential return on investment than US Treasury bonds. Some infrastructure projects will also allay security concerns, like the energy pipelines to be built through Myanmar that will bypass the watery bottleneck of the Malacca Straits where a determined adversary could potentially shut off 80 percent of Beijing’s oil imports. Nor does Trump care a whit about the soft power the United States has traditionally used to cultivate international support. For instance, Washington had long promoted international financial institutions and free trade agreements, but Trump has railed against the “false song of globalism.” China, meanwhile, is positioning itself to become the new overlord of global capitalism, even going so far as to set up a parallel international financial system to realize its vision. The Asian Infrastructure Investment Bank (AIIB), which began operations in January 2016 without the support of the United States or the European Union, will function like the World Bank in providing financing for China’s various building projects abroad. Whereas Beijing controls less than 5 percent of the votes at the World Bank, it commands 28 percent of the shares in the AIIB. Although still a small operation compared to China’s commercial banks, it will be quite capable of scaling up if the opportunity arises. All of this is part of a larger trend of power flowing from West to East. In 2010, North America and Western Europe were responsible for 40 percent of the global gross national product. By 2050, that share, the Economist Intelligence Unit estimates, will fall to 21 percent, with Asia’s share rising to a commanding 48.1 percent. The apparent defection of the Philippines was the coup de grâce for one of the Obama administration’s most heralded foreign-policy efforts aimed at staving off American decline. In October 2011, just before the Arab Spring broke out, Secretary of State Hillary Clinton authored an article in Foreign Policy laying out what would become known as the “Pacific pivot.” The United States, at the time, was fitfully trying to extricate itself from wars in Iraq and Afghanistan. Thanks to imports from Mexico and Canada, as well as investments in shale fracking and sustainable energy, Washington was no longer quite so dependent on Middle Eastern oil. The Obama administration felt that it might finally put the failures of the Bush years behind it and turn to new horizons. To recapture its edge in the region, the Obama administration promoted a free trade compact known as the Trans Pacific Partnership (TPP). US negotiators managed to achieve the near impossible by getting a dozen disparate countries on the same page while leaving China out of the picture. But Congress proved, at best, lukewarm on the deal. And sentiment among the American public ran even colder—so cold, in fact, that one of its chief architects, Hillary Clinton, fearing that the trade agreement might take her presidential bid down in flames, came out against it in 2016. Withdrawing from the TPP would, of course, be one of Donald Trump’s first acts as president. The United States, in fact, faces more than just an economic challenge in Asia. Washington had long considered the Pacific to be an “American lake.” It currently has 375,000 military and civilian personnel stationed within the Pacific Command’s ambit and devotes roughly half its naval capacity to Pacific waters. It maintains treaty alliances with Japan, South Korea, and the Philippines, as well as dozens of military bases in the region. 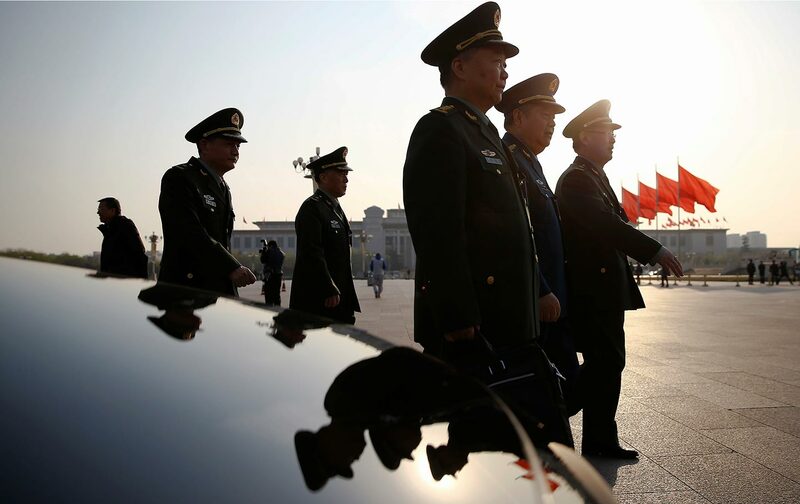 But China, after more than a decade of double-digit increases in military spending, has begun pushing back against American pretensions to be the only Pacific power around. It has developed new weapons to deny the US military access to its coastal waters and has come to excel at cyberwarfare, vacuuming up huge amounts of confidential data by hacking into US government agencies. Meanwhile, in the world of spy versus spy, China has managed to plug leaks on its end by jailing or killing more than a dozen US intelligence assets. Even before the ascension of Donald Trump, the Pentagon’s effort to pivot eastward had come up short. For all its overwhelming military edge, Washington has increasingly found itself unable to dictate outcomes through force anywhere in the Greater Middle East. The rise of the Islamic State in Iraq and Syria, the resurgence of the Taliban in Afghanistan, and turmoil in Yemen and Libya have all continued to bedevil the US military. In the meantime, the Obama administration made some token rearrangements of its forces in the Pacific, sold some high-tech weaponry to its allies in the region, and threw some brush-back pitches at Beijing. But in the end, as with so many of Obama’s initiatives, the Pacific pivot proved largely aspirational. The United States never really pivoted out of the Greater Middle East. As a presidential candidate, Trump was content to bluster about Chinese threats, even as he also threatened to withdraw the US nuclear umbrella from both Tokyo and Seoul. He demanded that US allies pony up more money for American help and protection, while offering no new ways of anchoring the United States in the Pacific. Now in the Oval Office, Trump has sent mixed signals. He’s repaired relations with Chinese leader Xi Jinping, but he’s also been pushing a major rise in the Pentagon budget. And what country would be the target of those additional tens of billions of dollars in military spending? The US Navy certainly doesn’t need a 350-ship force to counter the Islamic State. Trump has welcomed the election of South Korea’s new president, Moon Jae-in, but also insists that he wants to renegotiate “bad” trade and security deals with South Korea. He has tried to bully North Korea, but has also held out the possibility of meeting personally with that “pretty smart cookie,” Kim Jong-un. Meanwhile, it’s not only Japan that faces a demographic crisis. The fertility rates of both Taiwan (1.12) and South Korea (1.25) are even lower than Japan’s (1.41), while China’s (1.6) is only a bit higher. None of them is close to the replacement rate of 2.1. Approaching 2050, all four countries will have to dig deep to pay the retirement benefits and healthcare costs of all the industrious workers currently outperforming their counterparts elsewhere in the world. What was once called “Japan passing”—investors skipping that country in search of better opportunities elsewhere in the region—is already morphing into “China passing.” Financial flows are also going to be affected by the rising waters of climate change, which, later in the century, will threaten major cities like Tokyo, Shanghai, Hong Kong, and Singapore. Predicting the coming supremacy of the East has been a veritable cottage industry in the West, and its stock is still rising as China’s One Belt, One Road venture, meant to tie the vast Eurasian continent together, goes head to head with Trump’s “my way or the highway.” The future, however, promises to be far messier than China or its boosters imagine. Demographics, corruption, and reduced economic growth—not to mention environmental degradation and the declining legitimacy of its ruling party’s ideology—are by no means the only problems that Beijing faces. Both these supranational ideologies, which flourished in the region during the Cold War, have entered hospice care in the 21st century. Communism has functionally disappeared from the region, replaced by nationalisms of varying degrees of intensity. Xi Jinping’s China and Kim Jong-un’s North Korea are hardly the only places where nationalism has taken root. In Japan, for instance, Prime Minister Shinzo Abe is busy trying to rebuild the very militarism that the United States once professed to despise. A succession of US administrations has aided and abetted this right-wing nationalist effort to dispense with the country’s post-World War II “peace constitution” and push the Japanese Self-Defense Forces onto the offensive. At the moment, those two countries are cooperating in one key area: pouring money into the kind of military hardware that could someday lead to a catastrophic showdown. This reality has led ever more foreign-policy analysts to invoke the “Thucydides trap,” in which a rising power like Athens (read: China) takes on the hitherto dominant power Sparta (read: America) in a long, debilitating conflict like the Peloponnesian War (read: World War III). And yet China is not alone in feeling a backlash in the region. In South Korea, for instance, a decade of conservative rule came to a crashing end with the impeachment of President Park Geun-hye on corruption charges, a hastily organized election, and the victory of progressive Moon Jae-in. The new South Korean leader is no firebrand, so don’t expect a dramatic break with Washington. South Korea has been subservient to the United States for too long to risk that any time soon. Moon has, however, promised to take another look at the missile defense system—the Terminal High Altitude Area Defense (THAAD)—that the United States worked so hard to deploy in South Korea before he took office. The new president also wants to mend fences with China, the country’s largest trading partner, and revive a more cooperative relationship with North Korea as well. Meanwhile, in Japan, opposition from politicians, activists, and ordinary citizens in Okinawa has blocked a plan hammered out in Tokyo and Washington to close an old US military base in the city of Futenma, only to build a replacement elsewhere on the island. Okinawa is where America houses a good deal of its Pacific firepower. The refusal of Okinawan inhabitants to support the construction of the new base has not only scrambled the Pacific plans of both Barack Obama and Hillary Clinton but given new legitimacy to the idea of withdrawing US forces from Japan and South Korea to a secondary tier of islands like Guam. If liberal internationalism no longer appeals to US allies in Asia—or, indeed, to the new leadership in Washington—it might be easy enough to assume that the future will be a replay of the past: the return to a Sinocentric universe that prevailed for 1,000 years or more in the region. Instead of local satraps loaded with gifts visiting an emperor in Beijing, the leaders of Cambodia, Laos, Myanmar, and the Philippines will build dams and ports and pipelines with Chinese money and then repatriate much of the proceeds to that country. As it happens, though, the intensification of nationalism in Asia has greatly complicated this picture and may leave leaders like Duterte playing Beijing off against Washington, or striking out on their own, or perhaps seeking help from India—or even Saudi Arabia, which has made a bid for greater influence among Muslim-majority countries like Indonesia and Malaysia. If the rise of China has caused much anxiety in the West, so has the possibility that no country will become dominant in Asia in the wake of US decline and that a new kind of chaos will descend on the region. In other words, despite all those dreams of Asia’s glittering future, it’s unlikely to resemble the peaceful prosperity of Europe, nor is it likely to see a continuation of US hegemony or a repeat of the China-centered system of centuries past. It’s likely, however, to involve population decline, economic contraction, heightened nationalism, and rising waters—a future, in short, filled with troubles and dangers of every sort.